And what a day it was! The first launch at 0444 by Guy and Symeon in a K21 was followed by some K13 Cabriolet sorties to enjoy both fresh air and the sunrise. Breakfast was provided by Marnie and Simon, who continued to produce food throughout the day for the assembled multitudes. 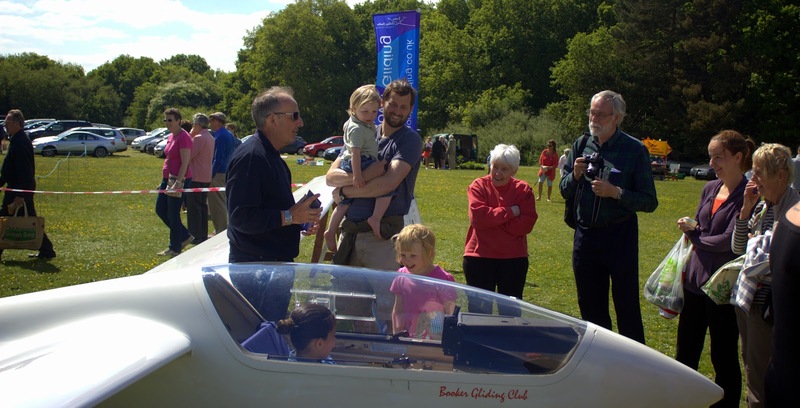 There were some white shiny gliders setting off to explore the phenomenal wave that set up - by late afternoon the sky was full of lenticulars - but the theme of the day appeared to be more Whispering Wardrobe.﻿ The Cabriolet K13 was as popular as ever. How did I get in last time I tried this? ﻿ Nick also had a go, he looks pretty happy about the prospect. How do I get out now? Nick would also have won the prize for best dressed aviator. Continuing the Czech theme, Graham's Lunak was also out, and Doug had a go. ﻿After the evening barbeque, Graham tested his digestion with a brilliant aerobatic display, enhanced with smoke trails. Next came a couple of dual tow exercises with formation flying. ﻿The final flight was Richard the CFI with an aerobatic flight and a hangar landing in a K21, after which it was time to pack up as darkness fell. Many thanks to Richard for organising the day (and staying awake for the duration) and to Marnie and Simon for their magnificant catering operation, and to all the club members, family and friends who turned up to make this such a successful day. At Booker we never let the calendar rule our lives, think of the infinite flexibility of the Easter Egg Cup. Similarly with the longest day, we intend to celebrate this on Saturday 29 June. The plan is to have first launch at 0416 and last launch at 2142, with free soaring before 1000 and after 1800. There will be breakfast, lunch and an evening BBQ to which all are welcome, including friends and family. If you would like to come along, please let the office know. I don't remember what Phil King said the ideal profile was but this has two significant inversions between which the wave can work and a steady wind direction with height also increasing steadily in speed. Also note how far the wave is travelling from its trigger points in the West Country! Sunday started off rather wet. However in the best French tradition the sun came out late afternoon and we went flying. Richard started just after 18.00 to go round 100km at about 100 kph. 370 managed 160 km at just over 90 kph. Dave Chalmers Brown made it to the first turn in the Junior and then went Aux Vaches. A very creditable distance. Some of the late launchers were showered back to the ground. Today the Sales and Marketing Team set off for the long journey (about 3 minutes) to Booker Common to take part in the Show. We soon had Pegasus 318 rigged and our banners and so on displayed, after which we entertained a continuous stream of small children wanting to sit in the cockpit, and their families and friends. We met again many of our fellow campaigners from the GASP anti-stadium days, and chatted with local residents who were fascinated to see up close the sort of aircraft which they see over their houses all the time. We offered a trial lesson as a raffle prize, so we hope to see the lucky winner at the launch point soon. The Show was held to raise money for the Booker Memorial Hall and the Air Ambulance, which is funded entirely by voluntary effort and receives no public funding. Many thanks to Chris Collett, Hugh MacDonald, William Parker, Symeon Economou and Stephen Greenham, who isn't solo yet but already knows how to rig and de-rig a Pegasus in a field. We have been flying continuously for 7 days with the Duo and Club gliders achieving about 40 hours in the air. The weather has been fantastic and many kilometers have been flown, with 75 launches to date. Internet access has been variable so we have not managed to post many flights. Although we are having a "rest" day Steve is already out with the Duo acclimatizing the new arrivals. Hakan Gokalp achieved his Bronze cross country Nav in the Duo, finishing off with a field landing. Several gliders have been Aux Vaches without problem. 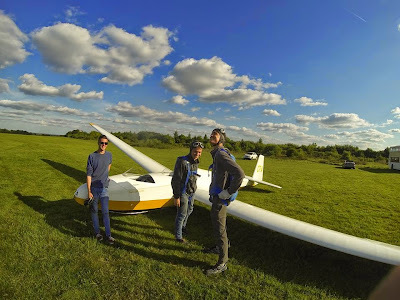 Rob Kehr flew his first 100 km in the Super Javelot.. 2A had an airing on Friday racing out to Thouars and back at about 120 kph with 370, helped by 6,000 ft cloudbase and 6 kt climbs. The main problem at Le Blanc is the noise; we are deafened at the launch point with the sound of skylarks, cuckoos and crickets. The weather has been warming nicely reaching 30 C yesterday, but cooler today. 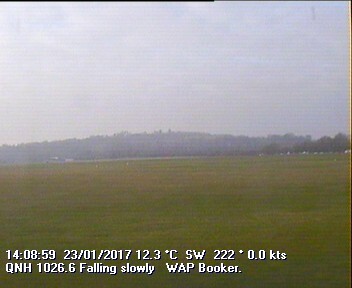 The weather forecast is a bit variable for the next few days so although locally soarable we may get a rest from cross country flying. .......and here are our two tuggies and summer instructor Andy in traditional dress, ready to take the air in our cabriolet K13. You can tell that summer's here.....and look at that sky! 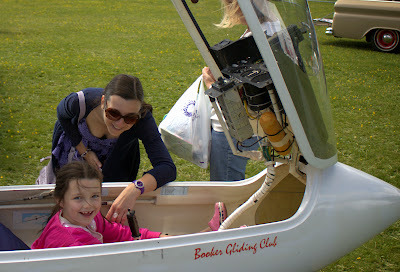 Whatever next - tuggies in gliders? The recent run of good soaring weather has continued and there have been some excellent cross coutries over the last few days. Sporadic reports from Le Blanc seem to indicate they are having a "temps très bon", so much so that they are too busy to post anything on the blog (hopefully there will be a more accurate update soon). Closer to home, things haven't been quiet at the launch point and Wednesday evening saw a brace of first solo's from the seasonal tuggies, Gus and Callum. Their grins say it all. Well done chaps, now we can have confidence that you know what its like pushing the rope as well pulling it. Will didn't just win the day. Look at the performance! Well done Will, a tremendous day out. Meanwhile, back at Booker it's been a busy weekend. The Le Blanc expedition party set off for the ferry with a selection of gliders both club and private, with a tug following close behind. They will be away for two weeks perfecting their radio calls of 'vent en arriere'. Those left back at base made good use of the unaccustomed sunshine, with flying going on late into the evening in excellent conditions. There appeared to be some ghostly instructing going on, pointing out the importance of keeping the string in the middle. Some unbidden ironing, cooking and general dogs-body duties had produced enough fun tokens for an afternoons flying. And Sunday delivered again with cotton wool clouds to the horizon. Although it wasn't quite a straightforward as it looked with really strong, tight thermals forming small cigar shaped clouds, which didn't live for a long time: So it was a case of getting to 4000 ft as quickly as possible, and staying there. The highlight of today's flight was a glider convoy along a cloud street from the Hambledon valley to Stokenchurch. I've never flown so long in lift without turning! Thanks to CFA leading the way: I was so busy picking 'a cloud' and thermalling, I was missing the opportunities to join them up in a street! At the end of the street we went our separate ways and I made a bee-line for some good looking clouds in the 5,000ft airspace west of the line from the Fair Mile fork to the Lewkner M40 junction*: Cloudbase stopped play at 4800 QFE Booker and the last 500 ft climb was sssslllllloooooowwwwwww as the thermal petered out long before cloudbase. *EDITED: When I say the fair mile - I've always considered that to be the entirety of the road up as it turns into dual carriageway up the hill and towards Nettlebed. 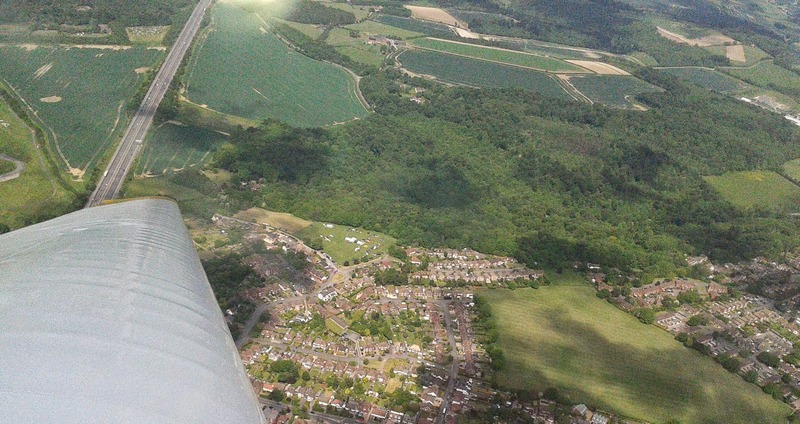 My bad for giving the impression I was over Henley at over 4000ft! I wasn't!